Almond flour is useful in many recipes. Homemade marzipan, petit fours, French macaroons, pie bottoms, paleo cooking etc. It is a little time consuming, but simple enough to make with a blender or coffee grinder. Cover the almonds with water. Let them cook for a few minutes. Put them into a bowl of cold water so the skin loosens. Deskin them by pressing with your thumb and pointer. Put plenty of time aside for it :-s boring! The almonds ends up being somewhat moist, so put them in a 200°C (390°F) oven for 10 minutes to dry them. Let them cool for half an hour until they are back down at room temperature before blending. Put the almonds into a blender or even better, a blending coffee grinder. Sieve them through a slightly coarse metal sieve. If your sieve is too fine, it can be a problem. But there is nothing to do but to try it out. Alternatively you can shake the almond flour in a bowl and scrape of the coarser pieces with a spoon. Which you then can blend again. 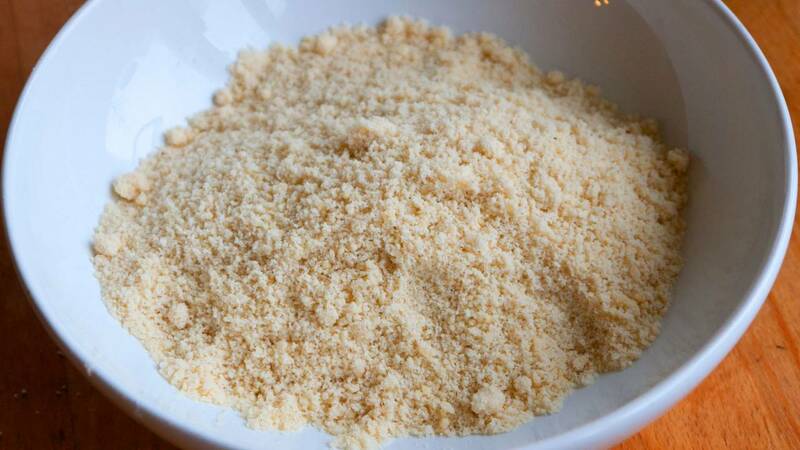 You can make "graham almond flour" if you just rinse the almonds instead of de-skinning them. This is a something darker and slightly more bitter flour. They should still be dried inside the oven after you rinse them. The blending coffee grinder is the best tool for making the almond flour. It spins a bit faster and so makes a finer flour. But don't blend too long time. You risk making almond butter because the almond oil separates.